AptEner Technologies, a Bangalore-based start up is now selling the BluSnap, a helmet cooler that can fit any full face helmet. This cooler is meant to keep motorcycle riders comfortable, especially in hot weather during city traffic crawls. Here’s the first customer video review of the BluSnap. Watch how the helmet cooler fares in humid conditions of Mumbai, where it was tested by YouTube Motogenesis. As you can see in the video, it’s pretty easy to get this product fixed onto your helmet. It hardly takes 5 seconds to be fitted/removed. Eventually, the makers of this innovative helmet cooler plan to build helmets integrated with the cooler. Those helmets will be a lot less bulkier we believe. For now though, this is probably the best way bikers can beat the heat and dust of India. This helmet cooler costs Rs. 1609, and can be ordered here. In case you didn’t know, this helmet also has a handy air filter that cuts out dust. This is another useful feature that a lot of motorcyclists will appreciate as air pollution is a big problem in Indian cities. Any way to get cleaner air to breathe is a good thing. The air filter that the BluSnap packs in can be periodically cleaned. It needs to be replaced once in 3-6 months depending on how dirty it gets. And spares will be made available. The BluSnap helmet air cooler is said to detach upon impact and is said to be safe for use. 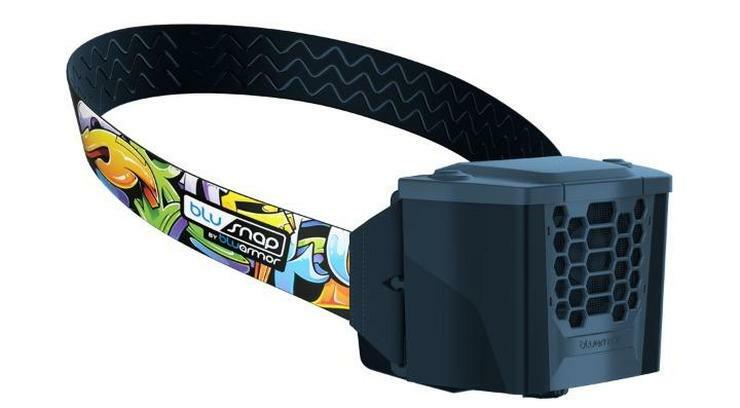 However, it’s unclear if the BluSnap has actually been tested in real crash conditions. Meanwhile, the helmet cooler comes with a lithium ion battery that can be recharged with a micro USB charging cable. It also gets a small water tank – similar to larger desert air coolers. Essentially, the BluSnap is a miniaturized version of the standard desert air cooler that you see in homes around India.